This lecture was organized with the support of the Royal Norwegian Embassy in collaboration with the UCD Sutherland School of Law. 26 April 2018 at 5pm, room F103A, Newman Building, University College Dublin. Dr Jyoti Atwal (Jawaharlal Nehru University) delivered the annual VV Giri Lecture at the Sutherland School of Law, University College Dublin. Years 1915-1916 hold special significance in the history of India and Ireland. Politically, the radical anti imperialist groups acquired confidence in the belief that revolution was achievable through armed uprising. Historians of anti imperialist movements (Chandra:1989; Josh:1992; Mukherjee:2005; Malley:2008) have pointed out to the international impact on the Indian freedom movement. The presence of VV Giri in Ireland and of Margaret Cousins in India durin g 1916 is highly significant. 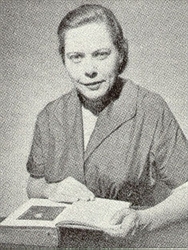 Their unique international experiences prepared them for an anti colonial methodology which included constitutionalism, Gandhian Satyagraha (passive resistance) and socialism. Margaret, an Irish suffragette and a founder of Irish Women’s Franchise League (1908) with Hanna Sheehy Skeffington, sailed for India with her husband, James, when the suffragette activism was at its peak. This paper seeks to explore how feminist scholars have attempted to ‘put women into history’ in Ireland (Murphy:1992; Daly:2008;Paseta:2013;Urqhart:2001) and India (Basu:1990; Forbes:1996; Kumar:1993). I will focus on the period from 1916 till 936 when Margaret and James were actively engaged in the political life of India. I seek to address three themes – one, the question of politics of collectivity; second, creation of national ideals and thirdly, issues of economic reconstruction. Dr Jyoti Atwal is Associate Professor, Centre for Historical Studies, School of Social Sciences, Jawaharlal Nehru University, New Delhi, India & Adjunct Professor, Department of History, Faculty of Arts, Humanities and Social Sciences, University of Limerick, Ireland (September 2017- August 2022). She engages with issues pert aining to Indian women in the reformist, nationalist and contemporary perspectives; socio cultural and religious aspects of women’s lives in colonial and post colonial India; women’s agenda and the nation; autobiographies of women and narratives of the personal and the political domains; politics of representations of gender relations in colonial India; dalit (low caste) women’s history. She has recently published a book entitled Real and Imagined Widows: Gender Relations in Colonial North India, Delhi: Primus, 2016. She has recently introduced a new course on Women in Ireland: Reforms, Movements and Revolutions (1840-1930)’ for post graduate students at JNU. Currently, Dr Atwal is researching on an Irish suffragist in colonial India – Margaret Cousins (1878-1954). She has been a Visiting Faculty at Dublin City University in 2013; Trinity College Dublin Long Room Fellow in 2012. 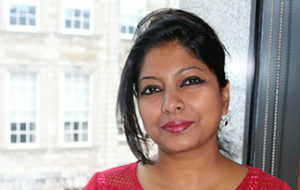 She is a member of the executive team of the India Studies Centre Cork at University College Cork and a member of the editorial board of Women’s History Review (UK, Routledge). 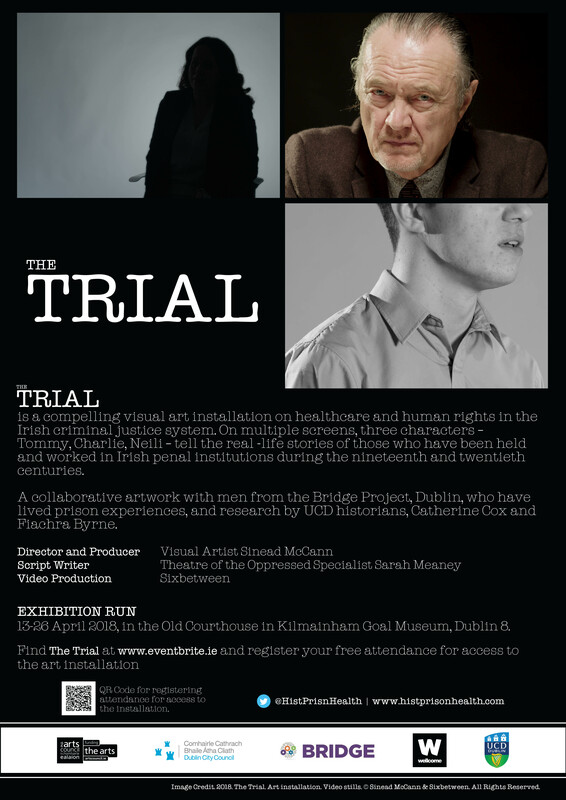 ‘The Trial’: a visual art exhibition which focuses on the experiences of those who have worked in the Irish penal system in the 19th and 20th centuries. It explores human rights and healt hcare in the Irish criminal justice system. UCD historians Catherine Cox and Fiachra Byrne have collaborated with men from the Bridge Project, Dublin to create this unique installation. The exhibition ran from 18-23 April 2018 at the Old Courthouse in Kilmainham Gaol Museum. See www.histprisonhealth.com for more details about the project.